La Centrale is Miami’s first-ever Italian food hall conceptualized by notable NYC restauranteur Jacopo Giustiniani (SA Hospitality Group, Felice Wine Bars) with retail and food hall expert Matthias Kiehm (Harrods, Four Seasons Paris). La Centrale offers 14 different and truly authentic, Italian-inspired dining experiences spanning three stories and 40,000 square feet as the anchor tenant of Brickell City Centre in Miami, Florida. “Our experience with Barrel was exceptional from the get-go. It is one thing to hire a professional team to create your vision. It is another thing entirely to hire a team who share that vision with you and genuinely want to see it excel. The La Centrale team hired Barrel to help showcase the breadth of the food hall’s offering and to capture the excitement and unique feel of the brand. We collaborated closely with design firm Love and War to extend their beautiful brand system to the web. 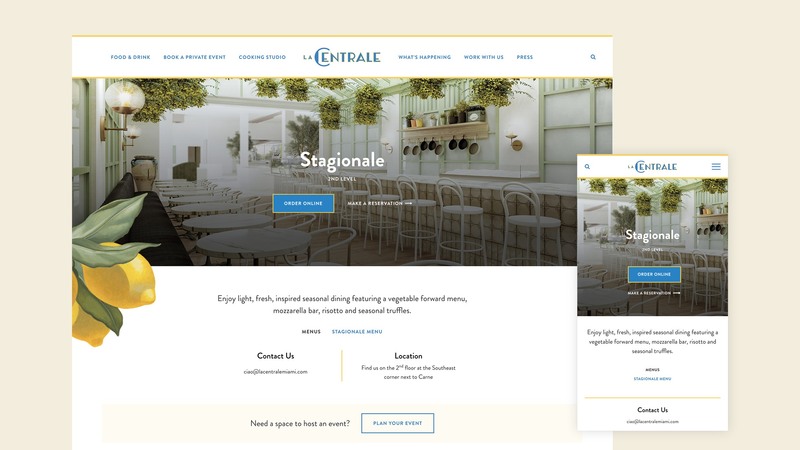 The result is a modern, mobile-friendly web experience that features rich imagery and easy-to-navigate sections where visitors can learn about the different restaurants, bars, and events happening in the space.